Cut out this card and place the image on your door to signal to students and families that this is a safe space. Create a classroom where all students are welcome and supported no matter what – teach lessons that tear down stereotypes and promote inclusivity and empathy. More information. 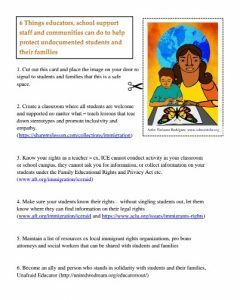 Know your rights as a teacher – ex, ICE cannot conduct activity in your classroom or school campus, they cannot ask you for information, or collect information on your students under the Family Educational Rights and Privacy Act etc. More information. Make sure your students know their rights – without singling students out, let them know where they can find information on their legal rights. Here’s more information. Become an ally and person who stands in solidarity with students and their families, Unafraid Educator.